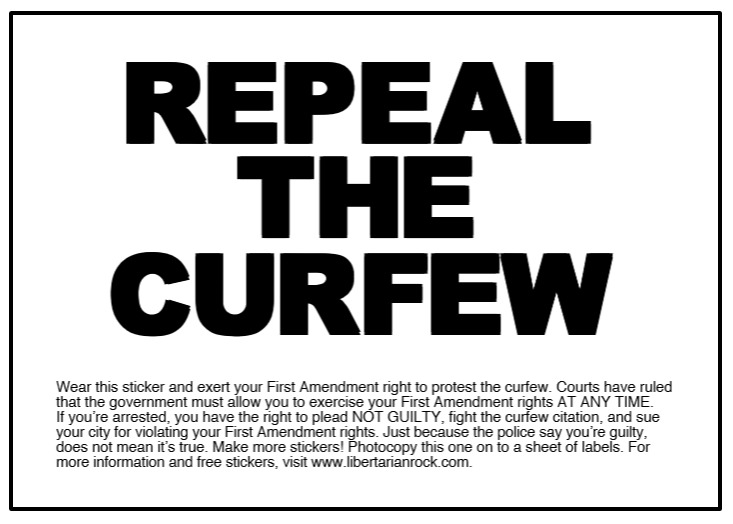 Many curfew laws allow a first amendment exception that allows people to be out past curfew if they are engaged in any activity listed in the first amendment. This page has directions on how to make stickers that say “Repeal the Curfew” and other messages. Wearing a sticker is engaging in free speech. I made and distributed these stickers around the time of the San Diego curfew protests back in 1997 (20 years ago!). This page focuses on the free speech option, but having a meeting of your own personal church at 2 a.m. would be a first amendment activity as well. My idea is to wear a sticker or button that says a political message and that means you are engaged in free speech activity since you are promoting a message. Yes, you might just be promoting that to your girlfriend or boyfriend on the beach at midnight, but the location is immaterial. To make stickers yourself, use one of the templates linked below. You will need to get box of label sheets that are simply one big sticker that is the size of a piece of paper. Download a sticker template, photocopy it on to a letter-size sheet of labels, then cut the big label into eight stickers. 2. Print out the templates. 3. Photocopy a template on to a letter-size label; this label is similar to mailing labels but instead of having 20 or 30 labels on a page, the page is simply one label. 4. Cut each full sheet label into 8 individual stickers. What to do with the stickers? Wear the stickers, put one on your car, put one in your locker and don’t let the police, politicians, or judges take away your rights as people of the United States. A more environmental approach would be to get a button that says “Repeal the Curfew” or another political message. In fact, it’s likely easy to get a political button. Wear a button that says “Say no to nuclear power” and you are engaged in protected free speech that could be done any time and really on any public property.